Had more than one sweeper. 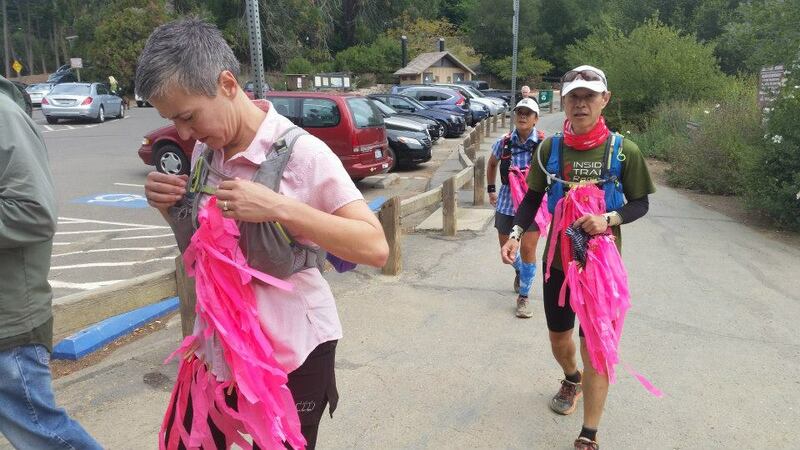 Since we were sweeping the entire course, doing it with a couple of people meant we could share the load in terms of carrying flags, signage and ribbons. Besides more eyes on trees means you have a better chance of not missing something when you start to get tired. Gave back (and trained). You know the people handing you your bib in the morning? The ones filling your water bottle? The ones cooking your burger at the post-race barbecue? Volunteers. Those ribbons didn’t tie themselves to the trees and they aren’t coming off without a little help. It’s good to give back and being a sweep still let me get a solid block of training in. Showed up. Seriously, the Race Director needs reliable people and if you volunteer and don’t show up that means hours of extra work that falls on other people’s shoulders, people who probably already have a full plate. Life pops up. At least have the decency to let the Race Director or Volunteer Coordinator know with enough lead time so they can plan ahead of time. Sweeping is hard. I’d had solo swept the Flying Monkey Mesa loop (~16 miles) at the Zion 100 earlier in the year and I’d forgotten that sweeping is work. You are stopping and starting your running so you never develop a rhythm. You are also carrying items like bags for ribbons and signs that makes moving awkward. Thirty-one miles of that is a long day at the office. Sweeping is lonely. Skyline is essentially a giant loop with a short out-and-back section where we saw the leaders but we really didn’t see anyone else. Depending on the course you may never see another race participant. You actually don’t want to see another race participant because that means someone is having a really bad day. But sweeping can also be fun. Do this with a couple of friends and you are guaranteed good times, with or without a machete. Yes, this is an inside joke the origins of which escape me but I couldn’t resist. Start sweeping right away. The Race Director wanted us to sweep 30 minutes after the start but with all the stopping and starting that meant we were coming into aid stations long after they closed which meant potentially no food or water or opportunity to unload all the course marking material. Luckily, except for one aid station, supplies were either left for us or somebody stayed after it closed and we were able to get support that way. Plan as if there will be no support. Related to the first point above I didn’t really research where water could be obtained on the course like I normally would when I run in an area. I had just assumed we’d have access to the aid station. Food wasn’t an issue as much as water was. Again, this depends on the nature of the course. Prepare for the unexpected. You never know, after your sweeping duties, if you might find yourself at Gu Energy Labs meeting Rob Krar and Magdalena Boulet. So bring a change of clothing and an odor masking device.